Posted by Jonny Greenwood on 4/12/2019 5:25:31 PM. With the development of ebook, reading becomes more and more popular. People read ebooks with their cellphone, tablet and ebook reader frequently. But long time reading can get you tired easily and it will harm the eyesight. What if you are reading the exciting chapters of a novel but you've got eyestrain? At this time, you can choose to "listen" to audio ebooks. The audio ebooks are audio files just like the songs in your iPod. Instead of "reading", "listening" to book can free your eyes and hands. You don't need to stare at the screen or hold on the device. 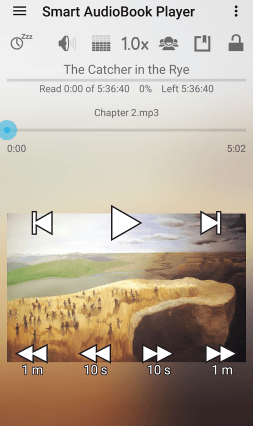 We all love audiobooks, but how to listen to audiobooks on Andriod device? We can divide these two methods according the money cost: paid and free. The paid method is listening to Audible audiobooks on android while the free way is listening to free audiobooks on Andriod device. Audible is the audio book provider of Amazon ebook reader. It has thousands of audio books. Like most ebook readers, Audible also has an Android app. Search "Audible" in Google Play and install it on your Android device. The first time you launch the Audible app, you'll be asked to fill in your account information. Just sign with your Amazon account or you can register a new one. The interface of Audible looks like the Kindle app for Android. You can see the CLOUD and DEVICE category. Tap the cart icon to enter book shop. You can search the book title directly or find books through different filters. If there are any books you want to buy, just tap a book title and go to the purchasing page. You can either add the book to wish list or buy directly. Once the purchase has been finished, the book should list on cloud in your library page. You just have to tap the book title you've purchased to download it. Once the downloading proccess has been finished, you can play it on your device. The Audible player provides various options for adjustment. You can set the speaking speed, take notes and add book mark. If we do not have Audible apps on our Android device, can we listen to Audible book on Android? The answer is yes. As we know that we need to download them to our device at first before listening them, but the downloading will cost a lot of time. You may think that I've already downloaded these audiobooks to my computer, can I just copy them to my phone directly. The answer is no. As we know that, all Audible books are in .aa or .aax format and protected by the DRM. You have to convert .aax/.aa books to MP3 format before copy them to your phone. Audible converter enables you converter Audible .aa/.aax to ?MP3, AC3, M4A and FLAC that are supported by most popular media playing devices and players. When the Audible converter has been installed, drag your Audible books to it and choose MP3 as the output format. Then click on " convert" to finish the coversion. Finally, you can find the converted mp3 audiobook. Connect you Android device to your computer via USB cable. Then create a new folder "Audiobooks" on the Andriod device Drive on your PC. Now you can copy and paste all Audiobooks to this folder. To be mentioned, you have to keep different audiobooks in different subfolders because the app we are using will assign each folder as an audiobook. 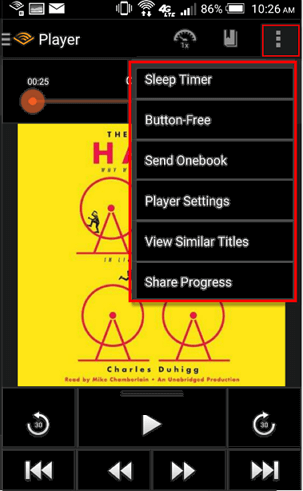 Get the Smart AudioBook Player from Google Play. After this app has been installed successfully, just open it and select the folder your audiobooks stored. Then you can begin to play your audiobooks. This player provides so many good features, such as showing the book metadata, play time, left time and so on. It also allows you lock screen and change the play speed. The most important feature is this apps can remember your pause place. So when you come back days later, it will pick up where you left off. Most audio books on in Audible are paid ones. So here I recommend you a free option: www.booksshouldbefree.com. You can download many free audio books in this website. But most of them are not fresh ones. Old books are in the majority. Choose a book from the left filter or search book title in the search box. In the detailed page of the books, you can choose to download stream the audio book. Click "MP3 Download" in the left side to download the whole book or you can just download some chapters in the right side. Transfer the .mp3 files to Android device and then you can enjoy the audio books. 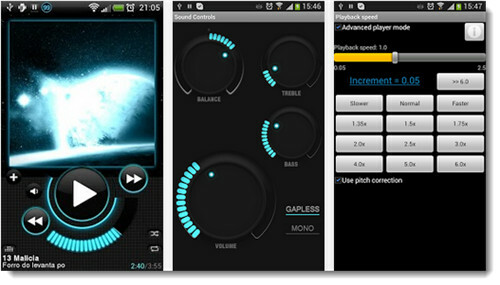 The original music player of Android can play the audiobook but it's not very suitable. Here we recommend you a professional audio book player – Astro Player Pro. It has powerful bookmark feature that could record your reading progress. You can search "astro player pro" in Google Play of your Android device. As we know there are many websites provide free online audiobook listening, so if you can open these websites by the browser installed on your Android device, you can listen to the audiobook online. You can find 50+ websites with online audiobook listening service. 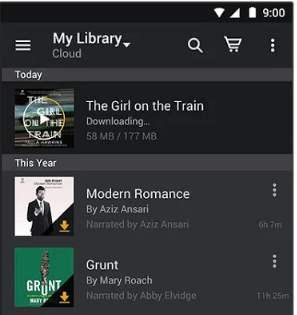 Now you can listen to audiobook online without downloading any apps or audiobook when you have your internet connected. These two methods have their own advantages and disadvantages. If you choose to listen to Audible book, you have to spend a lot of money to buy the audiobooks, or you can just use their audiobook subscription service. No matter which one you choose, it will cost you a lot of money. But Audible has so many auiobooks for your choice, and you are easily to find the book you want to listen to. If you choose to listen to free audiobooks, you can save your money. But the audiobooks may very old and sometime you can not find the book you want to listen to. We can not have the cake and eat it. You can choose the most suitable way according to your reading custom.